If you are looking for a unique way to get around, you can’t really do much better than the Segway MiniPRO. This self-balancing transporter has a lot going for it, and has to be considered one of the most technologically advanced transporters on the market today. At just 28 pounds, it’s a perfect size for personal use, and it also helps that it has passed the UL 2272 certification from Underwriter labs, which means that it is also incredibly safe. This is a unit that has been tested to the limit, and which has passed them all with flying colors. We are going to give you an in-depth Minipro review that will help you decide is this is a self-balancing transporter that will work for your specific needs. The Minipro certainly looks the part, and is available in both black and white. There may be more color options made available in the future if this one takes. While this may appear to be a unit that’s made with kids in mind, nothing could be further from the truth. A closer look at the features will help you understand why. 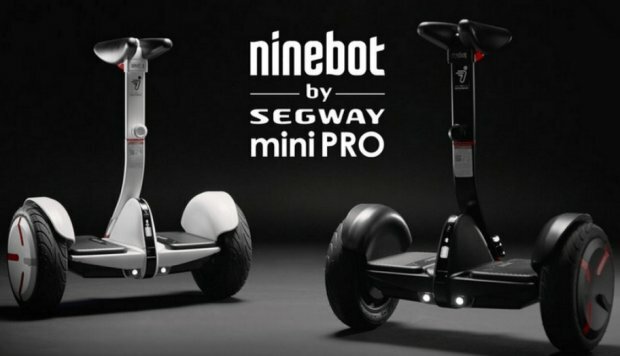 Modern vehicles all now feature some form of connectivity, and the Segway Minipro is no different. There is a smartphone app available that helps you control your transporter, but this is much more than just a directional app. When you have a transporter that looks this good, people are going to want to get their hands on it. The good news here is that the Minipro comes with an ant-theft lock that keeps those unscrupulous types away. Any sort of unwanted tampering will create an alert that is sent to your smartphone app. This is not a unit that is going to tear it up as far as speed goes, but its 10 MPH top speed is more than enough for a vehicle of this type. On a full charge, you can expect to get about 14 miles of riding enjoyment out of it, although a number of factors can adjust that number up or down a little, with riding conditions being the biggest of those factors. Controlling the Segway Minipro is done by using a knee control bar that can be adjusted to fit just about any rider. This makes the unit very easy to control, and makes it a much more controllable form of travel than hoverboards. We are big fans of the self balancing scooters, but there are people that know more about them and can provide additional specson this product. Feel free to check the www.selfbalancingscooterreview.com website in order to find more details on the top-rated self balancing scooters.